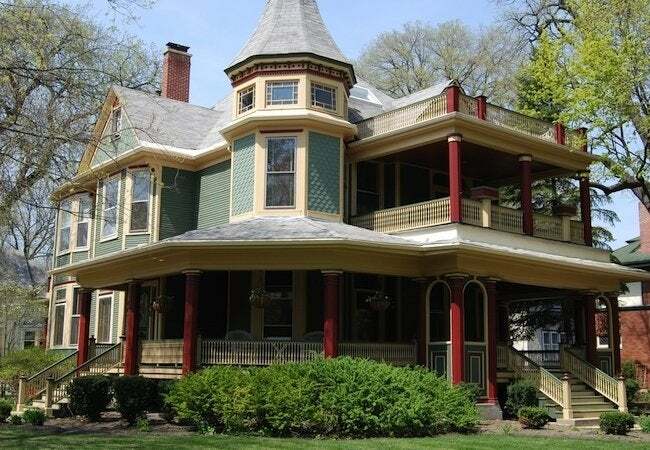 While named for the English Queen, the Victorian House is an eclectic blend of popular styles. The name comes from the English queen who assumed the throne in 1837 and remained in power until 1901. Victoria wasn’t a designer. As with her four immediate predecessors, the kings named George, her name came to be applied to the houses of her time out of chronological convenience rather than any true aesthetic connection between the monarch and the buildings of her age. If Victoria cannot be credited with instigating the fruitful architectural experiments of the time, the advent of the machine must be given some of the credit. Steam- and water-driven machinery made it possible for more people than ever before to afford well-made basic house parts like windows and doors, as well as decorative details like moldings and trim. Eventually stoves, plumbing fixtures, all kinds of millwork, and other goods were delivered via a growing network of canals and railroad tracks. Raw materials were also shipped inexpensively and new markets were opened up. In the forty years preceding the Civil War, America’s population tripled. All of which resulted in the greatest construction boom the world has ever seen. The world was changing at an unprecedented pace. Not surprisingly, people’s tastes changed, too, and not once but again and again. The first great style of the Victorian age in America was the Greek Revival. In the eighteenth century, the new science of archeology had revealed that ancient Greek and Roman buildings were not indistinguishable but dated from different eras altogether. Archaeologists found that Greek architecture had come first and that Grecian building was a key source for all subsequent European architecture In America, the Greek Revival found fertile ground and grew into the dominant style for some three decades. The Gothic Revival developed at about the same time. Its popularity and affordability was in part the result of advancing technology, as new power saws could shape the decorative woodwork (gingerbread) characteristic of the style. A wonderful Victorian eccentric named Orson Fowler dreamt up the octagonal house (he also was a practitioner of phrenology, a “science” that claimed to be able to assess character and mental abilities on the basis of the patterns of bumps on peoples’ skulls. The Italianate House was broadly popular before the Civil War; the French-inspired Second Empire Style reached its peak after the Civil War. Primarily German sources and the proliferation of inexpensive building materials produced the Stick Style, and students of early eighteenth-century English architecture developed the Queen Anne style. The Shingle Style was the last great style of the century. There were styles to suit almost any taste.